Protect your precious art against deterioration with archival matboards. Crescent Rag Mat: This museum-quality mat is made from a 100 percent cotton rag core sandwiched between a pure white backing paper and colored surface paper. All components are buffered, 100 percent acid-free and lignin-free. 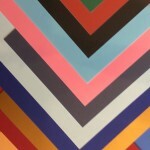 This is our preferred matting selection. Bainbridge Mat: Bainbridge offers a variety of “Artcare” mats that are not only acid-free, pH neutral, and lignin-free, but also feature patented microchambers to proactively trap and neutralize harmful air pollutants that would otherwise cause art to fade, yellow, or deteriorate. Even once you’ve decided your art deserves archival matboards, you still have many choices to make regarding the color, texture, and width of the mats. These choices can have a dramatic effect on the appearance of your framed art. At Allan Jeffries Framing, our frame artists excel in the creative use of matboards to achieve all kinds of visual effects. For example, we might recommend a boldly colored matboard to draw the eye to a black and white photo, or a very wide matboard to add bulk and presence to a very small painting. No matter what type of mat you choose, you can rest assured we will cut it to the correct mat size and opening size and mount it properly in your frame for a perfect result. If you’re not quite ready to invest in archival mats, don’t worry. You can use paper matboards to provide temporary protection while you live with your art for a few years and see if you love it enough to upgrade to archival matboards. 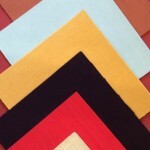 We also have handwrapped fabric mats and boards in linen, silk, suede, velvet, and textured fabrics. We invite you to visit any of our frame shop locations to see samples of archival matboards and other products in person and discuss your framing project with our staff.